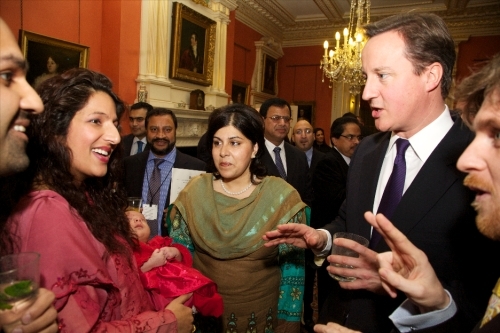 Sabina and Asif Iqbal and their newborn baby Rubi (5weeks old), were invited by Prime Minister David Cameron to attend the Eid Reception hosted by Baroness Warsi, Minister without Portfolio & Co-Chairman of the Conservative Party at Downing Street on Monday 22nd November 2010. The event was attended by a mixture of celebrities, Ministers, MPs, sport personalities, Business, Army & Navy chief officials and inspiring individuals. Baroness Warsi, Minister without Portfolio & Co-Chairman of the Conservative Party gave Sabina a big hug and kiss and congratulated Sabina for her fantastic achievements. Baroness Warsi also held Sabina’s daughter Rubi for the first time and said Rubi is gorgeous and congratulated both Sabina and Asif on their new baby also. Prime Minister David Cameron greeted Sabina and congratulated her for the wonderful achievements and the contributions that Sabina made to the communities. Sabina also congratulated the Prime Minster on his recent new baby daughter Florence. David beamed as a proud father and explained that Florence is now 8 weeks old and smiling a lot that David couldn’t help giving her lots of kisses. David asked after Rubi. Deputy Prime Minister Nick Clegg was also present at the Eid Reception and welcomed both Asif and Sabina and congratulated them both for their achievements.